No one sustained serious injury following a three-vehicle crash in Hillsboro Friday afternoon. 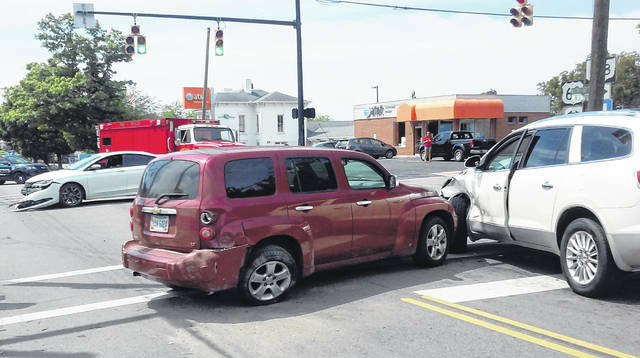 The accident occurred at about 12:30 p.m. at the intersection of North High Street and Collins Avenue. Officials said a maroon 2007 Chevrolet HHR driven by Samuel Risley, Hillsboro, was northbound on North High Street near Collins Avenue, when it ran a red light, striking a white Chrysler 200 sedan that entered the intersection from Collins Avenue. The force of the impact spun the HRR around and it collided with a 2011 White Buick Enclave in the southbound lane. Identification was not available for the other drivers. All three were treated and released at the scene. Risley was cited for failure to obey a traffic control device. Officers from the Hillsboro Police Department and EMTs from Paint Creek Joint Fire/EMS district responded. https://www.timesgazette.com/wp-content/uploads/sites/33/2018/08/web1_3-car-wreck-1.jpgNo one sustained serious injury following a three-vehicle crash in Hillsboro Friday afternoon. The accident occurred at about 12:30 p.m. at the intersection of North High Street and Collins Avenue. Officials said a maroon 2007 Chevrolet HHR driven by Samuel Risley, Hillsboro, was northbound on North High Street near Collins Avenue, when it ran a red light, striking a white Chrysler 200 sedan that entered the intersection from Collins Avenue. The force of the impact spun the HRR around and it collided with a 2011 White Buick Enclave in the southbound lane. Identification was not available for the other drivers. All three were treated and released at the scene. Risley was cited for failure to obey a traffic control device. Officers from the Hillsboro Police Department and EMTs from Paint Creek Joint Fire/EMS district responded.